This is a "Spring" update rather than a particular month largely since some people (me) didn't get around to doing an update at the end of March and here it is the summer solistice and camp season is upon us and things are about to get busy. Another reason it is a Spring update is that we managed to enjoy four springs this year. After rushing through the - 20 weather to get back to the claim while the ground was frozen enough to support the rig, we sat waiting for the snow to melt and experienced our fourth spring of the year - the first budding of leaves was down in the Rio Grande Valley in February, the second at Big Sandy, Texas in early March and the third was in Arkansas at the end of March. March 2 - Travel to Big Sandy, Texas for SOWERS project at ALERT academy. March 3 - go to Dallas to pick up our daughter and her husband at the airport. They will be helping out at ALERT on non-SOWERS project work for two weeks. They will be staying in staff housing, but we will still get to see them quite a bit I expect. She has worked for the ALERT/ ATI/ IBLP/ Bill Gothard facilities several times in the past, but this will be the first time since graduating as a civil engineer. Her husband is a pipe fitter/steam fitter so I am sure they will keep him busy too. Leaving College Station / Bryan we travelled East on local highways to Madisonville, home of the mushroom festival we visited last October. Then we fought headwinds on the Interstate North towards Dallas until we were about as far North as Tyler and we turned East. It avoided going through town to the RV park in Tyler, but at the expense of going a lot further than if we had left the Interstate and angled across from, say, Buffalo. In future we will probably take that route and did take on our return to Houston for the work to be done on the rig at the end of March. After arriving and setting up at the park in Tyler, we went to get dinner at Armadillo Willie's. A few confused passes back and forth in the general neighbourhood and we discovered that the restaurant was gone and had been replaced by a bank building. Quite a disappointment. A bit of exploring found us a hole-in-the-wall authentic Mexican restaurant that provided solid Mexican fare at a little too solid American prices. The dangers of no prices posted means that sometimes the regular (Mexican) clientele pay a differant price than stray gringoes do. Can't prove it, of course, but can't imagine that they would be that busy if the regulars were being charged what we paid. The guilty look from the waitress as she gave us a "free" empanada to try reinforced our suspicions. At least the food was good. On Friday we headed over to our SOWERS project for the month at ALERT Academy in Big Sandy, a few miles North of Tyler We had worked this project in March last year, as well. The parking required some ingenuity for sharing sewer, electric and phone, but nothing that couldn't be covered by a trip to Camping World. There were a few old familiar faces from the previous year and a few faces new to us. Hambricks were back, as was Rick Young. Down the page I'll talk about some of the work that was done but, first a word or two about other things and the pictures above. Our daughter, Rebekah, and her husband, Nick, also signed up with ALERT to do some work while we were there. She graduated last year as a civli engineer and he is a pipefitter/ gasfitter. She had done work before for other organizations in that group of organizations, working in Oakbrook, Oklahoma City and a couple of times in Indianapolis. Normally if you work for ALERT they pick you up at the airport, but we volunteered for that task on the Saturday, driving to Dallas and picking up some supplies at a Camping World on the way. The Dallas Ft. Worth airport is huge and confusing, but we met them at the right place and learned they had arrived okay but without their luggage. The options they were given were to come back at five or wait a couple of days for their luggage to arrive so we went sight seeing. We found a old train station turned into a museum and ended up watching some glass blowers making plates and vases in a building across from the museum. We stopped at a Goodyear dealer and he pointed out a flaw in the sidewall of one of the front tires and let one of his workers swap it out for the spare for a five buck tip (no work order). 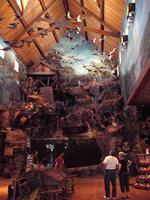 Then it was off to introduce Nick to a Golden Corral buffet and a Bass Pro sporting goods store. Neither are considered tourist attractions, but they are definitely an event for the first time visitor. We picked up the luggage and learned that we could have had it sent to the Tyler airport that day, but nobody had connected Tyler and Big Sandy. Oh well, it was a pleasant afternoon. When Rebekah was not working on a report on the campus gas lines for the Texas Railway Commision (TRC regulates gas lines and ALERT academy has miles of them on campus) and Nick was not welding in valves and elbows in the water system we did a bit of sight seeing together near Tyler. We stopped by the Goodman Museum. The attendant was AWOL so we didn't see inside, but the grounds were pleasant other than the stench of those beautiful white blossoms. One afternoon we toured the buildings and grounds of Roseland Plantation West of Tyler. There was another couple that the owner kind of knew one half of so we got to tour the original plantation house that the owner has almost completed restoration upon and is living in. That is not usually part of the tour. The site operates as a bed and breakfast, now, but was built up by some rich woman wanting to have a project to be featured in Better Homes and Gardens. There is a large metal building on site that looks like it might be a tractor barn, but inside is a climate controlled zone containing a full sized replica of DaVinci's Last Supper. She saw it in Italy and hired a couple of Italian artists to come over and paint her a copy. It sometimes happens that we do things out of duty that work out to be far more enjoyable than expected. Nick had been a Boy Scout. I guess I had been a Cub Scout once, too, but it the experience is not a big part of my present consciousness (or unconsciousness as it appears some days). Nevertheless the National Scouting Museum was on Nick's list of want-to-do's. The day we drove them back to Dallas-Ft. Worth airport we drove the Azalea Trail in Tyler and then stopped at the National Scouting Museum in Irving, Texas, near Dallas. In addition to the Norman Rockwell section and lots of displays about scoutig and scouting history there we a number of interactive and hands-on displays including a shooting gallery, a mountain bike race and a fishing simulator. An overall great place to visit and at a price that appealed to my no so inner cheapskate. Nick, as a former scout, did even better on the admission fee. As usual everyone kept busy. ALERT Academy is on a campus that was the former campus of a well known college before that group fell into financial difficulty. With the previous owners there were around a hundred maintenance staff. Now they get by with about ten full time people and the occasional handful of temporary volunteers such as SOWERS. One of their biggest expenses is energy consumption. There are things they could do to drastically reduce this consumption, but they struggle with the funding and the organizational will to make the investment in the automation. For brief times they can control things manually, but people have lives and other responsibilities and needs (like sleep) that make them poor ongoing substitutes for automatic controllers. The SOWER men worked on a number of things, including replacing wiring at the campground and water treatment plant and replacing some direct buried aluminum cabling that corrosion and gophers had taken their toll on. The women did painting, cleaning and helped with preparations for several upcoming ALERT events. Personally I worked with two other SOWERS to replace the conduit and conductors for the lighting in the water treatment plant . My first time on an airlift. Okay, I guess, but not my favorite place to be working. The one we were using leaked a bit so if it might drop a few inches just when you didn't expect it. If you were drilling holes in the ceiling you tended to feed a little air to the lift with the foot valve to compensate for the force of pushing on the drill. When you finished drilling the lift would scrunch you up against the ceiling. Also, another SOWER and myself worked on checking and replacing sump pumps in some of the over twenty 13,800 volt cable vaults. We skipped a few that made us too nervous such as the one with three feet of water in it or the ones where you had to lay on the cables to reach the pump. Found a lot that had been flooded and that we were able to figure out why the pump hadn't worked and corrected things so it should work next time. Also worked on a pneumatic control system for the administration building's HVAC. No drawings or documentation, but was able to figure out and explain how it was supposed to work and then took apart and put back together a pneumatic PI controller and it worked afterward. One never knows when one is going to find a use for skills learned thirty years ago! Juanita worked with the women and helped Rebekah after hours and on her days off. After the March SOWER project we skipped the re-union and headed South again, back to the SouthWest RV shop in Katy, Texas. They replaced a seal strip they had put in in December and I wasn't happy with and they added a natural stress relief point and a covering molding. This adapted the R-Vision design to one used by many other manufacturers. Between Big Sandy and Katy we stayed overnight in College Station, where we had another fabulous Mexican meal and I managed to lose my money clip. In retrospect this was a good thing, but I didn't think so at the time. The work done by SouthWest RV wasn't extensive, but still took them a few days to get done. In the meantime we managed to have an excellent visit with Juanita's sister and brother-in-law. 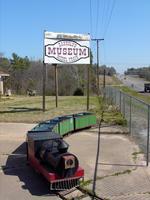 Then we headed out to the Northeast of Texas and over-nighted at a Passport America park in Texarkana, Texas. The next morning we went to the best organized Harbor Freight tool store I have seen before getting on the road to Arkansas. We went past the entrance to Crater of Diamonds State Park and stopped at an RV park. Our plan was to park and stay overnight there spending that afternoon grubbing for diamonds in the dirt of the State Park. The RV park was full as far as taking a rig of our size. I talked to the owner in her gift shop and asked about how boring digging for diamonds was, looked at a few samples of local diamonds and bought a couple of polished geodes for the grandkids. While we were talking a disheveled, slightly dirty woman came in saying her friend had stayed digging, but she and the kids had called it a day. They had dug for a day and a half and found a few small pieces of calcite, but no diamonds. She said that it was Spring Break and there were a couple of thousand people digging. The RV park owner said there was a large parking lot at the State Park and she gave the locations of a few RV parks to go to afterward. As we drove into the State Park there was a sign saying that something like 595 diamonds had been found in 2005. I did a quick, rough calculation of the odds of finding a diamond with a couple of hundred thousand person-digging-days involved to find that few and quickly lost interest in the experience. This was further reinforced as we went through the parking lot and saw few practical parking spots for our truck and fifth wheel, but did see families still arriving and hurrying toward the entrance gate with their buckets and shovels and children. Juanita was of the same mind and we hardly slowed down before taking the exit back to the highway. A couple of hours later we were nicely parked in an RV park on a ridge overlooking Hot Springs, Arkansas and it wasn't long before we had toured the area by truck and then parked and walked around to see even more of the bath houses and other sights. Then we drove through the crowds leaving the race track and settled into a gorge fest of pizza at a Cici's pizza buffet. Far more enjoyable than the sunstroke and grit of digging in a crowded dirt field. The next day, Saturday, we drove to Harrison, Arkansas, and stayed at a quiet RV park about twenty minutes South of Branson, Missouri. On Sunday we went to church in Harrison and then drove up to spent the afternoon in Branson, walking down by the river watching the buskers on the boardwalk and checking out some small shops as well as the Bass Pro shop, before driving on a circle tour of the area. We visited a fish hatchery and toured a winery. Both were interesting, but we sure got some funny looks at the winery when all we wanted to sample was the grape juice. Then we walked in a lake side park before finding a restaurant for supper. Monday looked like the last hot day we would see for quite a while so we got into shorts and tee-shirts and washed the rig and the truck. Juanita cleaned and conditioned the rubber roof. She noticed a spot where it was starting to separate at the front where it met the molding and I added some lap sealant. Although the temperatures were in the 80's F. there was a breeze and all was well. Tuesday it was on the road early and push against a head wind into and across Missouri. We had talked about taking a detour to see some MO projects, but once you're rolling you tend to want to keep rolling so we took a more direct route through Kansas City and toward Council Bluffs, Iowa. The park we planned to stay at near Rockport looked like it was permanently closed so we called ahead to a park in Little Sioux and made arrangements to arrive late. The temperature was dropping so we pulled into a rest area South of Council Bluffs and dumped the tanks. While stopped I tried to get inside the rig. The lock wouldn't let my key in. None of the tools I had would help so we called a locksmith and met him in a Wal Mart parking lot in Council Bluffs. A few squirts of WD-40 (I didn't think you were supposed to do that) and $US 50 later we were fine. Next time I'll buy my own WD-40. Grabbed a few minutes to walk across the parking lot and walk through a Menard's store (every town should have one) and covet the mitre saws and then we were back on the road again. Got settled in. By now it is well below freezing so I finished winterizing the rig by pumping anti-freeze everywhere and we walked to the showeres and bathrooms as required. The next morning we got up early and did the circle checks and started rolling - for about two hundred feet. Juanita went for one last walk to the bathrooms and I climbed up on the roof to check the front edge. It was much worse. It had opened up and you could see an area patch where the rubber roof material was lifted from the sheathing. I had visions of it coming totally unglued and billowing like a sail behind us so we looped around back into the same parking spot to figure things out. We called several RV dealers in the area. Closest was in Omaha 60 miles away across the river from Council Bluffs and he couldn't promise to look at it for a few days. Thought about it some more and came up with a plan and called the service manager where we had bought it (Guarantee RV in Edmonton). Uncouple the truck - drive fifty miles to Council Bluffs stopping at a dealer, but decided that they didn't have anything we could use and carried on to the Menard's and walked around the aisles until I found some aluminum flooring molding that would work. Back to the rig. Cut some EPDM to go between the roof and the molding. Screw the molding to the roof and add lap sealant to the crack in the old lap sealant. Hook-up. Do circle check. Find flat tire on inside of duals on driver's side. Go online. Find Goodyear dealers. Call around. Find one with the right size tires in stock. Call and get advice not to go over fifty miles an hour. Unhook truck from rig. Drive fifty miles back to Council Bluffs. Don't need new tire. They put on a valve stem. Offer me one, but price not that good after exchange and GST. Back to rig. Decide to spend another night where we are. Early the next day everything passes circle check and we are on the road. We fight a forty-five mph head wind and I'm pushing the truck hard 120 km/hr (80 mph). Got to get home while the ground is frozen. We pass everything but the fuel pump. Usually if I can take it easy (not pulling) we get over 600 km out of a tank of fuel. We're not getting two hundred miles on a tank of fuel. Kept the records but have been reluctant to go back and calculate actual fuel consumption and cost per km. Keep pushing hard. We cross the border South of Winnipeg at about six p.m. and stop for fuel at the Flying J West of Winnipeg. Then it's on the road again. We drive through Portage la Prairie and decide it is too early to stop in the Walmart parking lot. We briefly stop at a rest area in the middle of nowhere and decide to keep moving. Fuel is getting low. Juanita is getting nervous. I declare that we will stop at Russell, Manitoba and spent the night parked at the gas station if there are no gas stations open. There is one open. I fuel the truck while Juanita buys a couple of Subway sandwiches. We carry on to Langenburg, crossing into Saskatchewan about ten thirty p.m. and park in the rest area between the idling semis and the rail line. The rail line is busier than last time we stayed here. Was a little surprised in the morning not to see scuff marks on the side of the rig. The trains had seemed closer than they really were I guess. The next day we push on to Meadow Lake and drive down the rutted, but frozen grid road to our property, unlock the gate and drive onto the barren (but frozen) gravel pad praising the Lord for Willy Mcammon who plowed the snow off a few weeks back allowing what was left to melt away before the ground froze again. It would be weeks before the three and four foot drifts next to the drive and pad melted, but we didn't care. We were home for the summer! We spent time catching up with family and did some chores around the claim. There were trees to fell and gravel to haul, but not as much gravel as last year. A few loads of tree remains got hauled to the dump for their burning pile. I used to burn them myself in the middle of winter, but that's hard to do if you go South for the winter. It was time to start thinking about next winter. One possibility was helping a mission in the Dominican Republic. After several years of e-mail and telephone calls that finally looked like it was coming together and there was going to be the right combination of people in the DR so it was arranged for me to go there for five days on the way back from the trip to the coast for the 41st high school reunion, but let's talk about the coast trip first. Forty years is one of those milestone anniversaries. Not as much as twenty-five or fifty, but a milestone nevertheless. Long about the time we, the Max Cameron class of '66, realized that 40 years was upon us it was decided that not enough time was left so the 41st re-union was scheduled for this Spring. I guess we have slower reflexes as we get older, but make up for it with better decision-making. Juanita and I talked about driving out to Powell River, and before we knew it it had evolved into a family trip with our daughter, Deborah, her husband Ernest and the two grandaughters Sonja and Sasha. We took almost two weeks - leaving on a Friday, staying in Edmonton, Kamloops, and Vancouver, before arriving in Powell River on the Tuesday. We drove through the Fraser canyon and stopped at Hell's Gate. A few hours later we were beyond Hope. 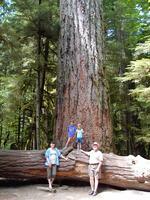 In Vancouver we visited Stanley Park, the Lynn Canyon suspension bridge and the Capilano hatchery. 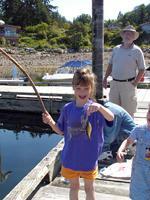 Once in Powell River we visited with family and went to beaches at low tide, waterfalls, fished for shiners at Lund and so on and so on. The first night of the grad re-union was Friday, June 1. As we drove into the parking lot I noticed some people and thought "we can't be that old!" and then realized it was one of our teachers I was looking at. I felt a little better. The reception was in the new Brooks School. The layout was similar so it there were some memories as we toured it even though the building is entirely new. It was good visiting, but you never get to talk to all the people you want to and you miss the ones who don't show up. Claudio came up on Saturday and we got to catch up on his plans for retirement, but couldn't convince him to join the grad reunion. He's consistent. He wouldn't go to grad in '66 either. His parents still gripe about buying him a suit and him not going. The second night of the grad re-union was held in the banquet hall of a local hotel. We had a buffet supper and a lot more visiting went on. There were a few people I don't remember as being in our graduating class, but maybe they don't remember me either. We held a minute's silence for the people who have died. We even mourned one who was still alive. Somebody had not got a Christmas card and assumed the worst. The error was quickly corrected right after the minute of silence. Unless we live a lot closer than we do it was probably the last grad re-union we'll attend. I tend to know about the people I was always close to and don't want to enter into some sort of death watch of "Who's left?". There. That was morbid wasn't it? On Sunday moring we took the ferry to Vancouver Island and stopped at Cathedral Grove and Big Qualicum before going on to Victoria where we spent two nights. We visited the butterfly gardens and used some Coast Points to go to lunch overlooking the inner harbour and did some general sight seeing. I bought some typically Canadian things to give out in the DR. On Tuesday we went to Vancouver and visited the aquarium before driving to Hope to spend the night. Wednesday it was a push up the Coquihala and through the Rockies to visit Banff and on to Canmore for the night. There was a bit of flooding, particularly at Golden. Thursday we arrived back in Edmonton and Friday I flew to New York while everyone else came home to Meadow Lake. The DR trip was interesting and educational. I got to sleep on the floor of JFK airport - a not particularly unpleasant experience. The promised family to stay with in the DR never materialized so when given the choice of an expensive hotel I hit the road, visiting acquaintances in Jarabacoa and coming to rest in a dive of a hotel across from the beach in Boca Chica taking gua-guas (second class buses) to the city for the interviews. The interviews went well. The work would be interesting for me and provide value to the ministry, but in the end the logistics looked impossible. One would either have to go just for a month and endure all the shortcomings or go for a year and invest all the time necessary to put together the necessities of existence, but six months is out of the question and six months is what we have. The trip was not wasted. I learned a lot about myself. Some of it bad some of it good, but most of it of practical value to apply to my walk with the Lord. I learned that I can travel rough and not be unhappy, but that nothing is as good as travelling with Juanita. Now here we are back at Bethel Gospel Camp until August.